The other day, I wore the capri leggings with an old striped dress from Banana Republic. I love brown and black together, and I love stripes, so the dress is a winner in my book. And since the dress is a bit short, I really love wearing it with leggings. I also wore my denim jacket as it was a cooler day. And I’m still loving my Coach Pebble Satchel. A great “little” bag that holds a LOT of things. Questions: What’s your go-to outfit at the moment? Is it hot yet where you are? It's been warming up toward the end of the week, but before then it was quite cool at times. Life has continued to be stressful over the past few months with a busy job, a kid who is involved in many activities, a young adult with “interesting” ideas, and aging parents with too many health problems to list and a certain level of stubbornness. Unfortunately, I haven’t taken care of myself the way I should for a while now. I don’t eat enough vegetable and fruits, drink too much coffee, and take very little time for myself. As a result, I haven’t been feeling my best. Those who have been reading my blog for a while will know that three years ago I was introduced to the Conscious Cleanse. At the time, I decided to do the cleanse at the spur of the moment after learning that it is not what I had imagined a cleanse to be (no or little food, basically a crash diet). Rather, the Conscious Cleanse focuses on whole foods. The results I got from the cleanse were truly amazing. I slept better, had clearer thoughts, little aches and pains went away, I was calmer, and I lost some weight. The results of the Conscious Cleanse were life changing as I felt better than ever before. And the way to get there wasn’t that hard (except for giving up caffeine, which was tough; I did really well without caffeine for two years after my first cleanse and really don’t know why I let it creep back into my life as I always end up drinking too much caffeine once I start…). But I’ve continued many of the principles I learned during the cleanse up to this day (warm lemon water to start the day, green smoothies, interesting salads, delicious vegetable soups, etc. 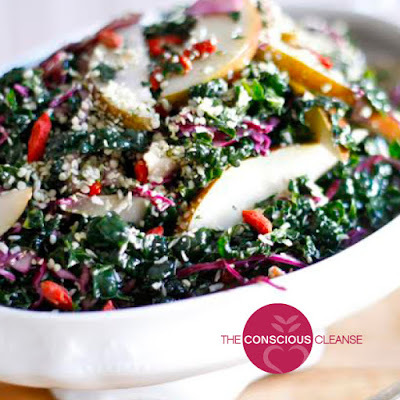 - the Conscious Cleanse comes with a manual as well as the Conscious Cleanse book and both contain many, delicious recipes). The Conscious Cleanse felt very doable because you eat real food and there is no measuring, rather you eat until you are satisfied while paying close attention to your hunger signals. The key for me is to do some prep work on the weekend and every morning while I do the cleanse to always have something to eat around that’s cleanse-approved. And that’s really also the key to living a less stressful life for me. There are some foods and beverages you are asked not to consume during the cleanse (caffeine, gluten, added sugar, dairy, eggs, etc.) because they are common allergens and many people cannot digest them properly. After the cleanse you can reintroduce them back into your diet one by one and see how you feel. I’m going to do another Conscious Cleanse starting on June 8. Having done the cleanse numerous times over the past 3.5 years, I certainly know what to do. But sometimes doing “the right things” when it comes to food and taking care of yourself isn’t all that easy. Life is busy as I said above, and when I considered doing another cleanse I thought “Do I really want to add something else to my plate?” And the answer is “yes” because taking care of myself has to be a priority. Only if I take care of myself will I be able to take care of others. I’m still following many of the Conscious Cleanse guidelines I learned over the years, but several things that are not the best for me have crept back into my diet. I know that doing another cleanse and really focusing on what I eat, how it makes me feel, and doing things for myself will be very beneficial to how I feel. Here is some information in case you are interested in the cleanse. 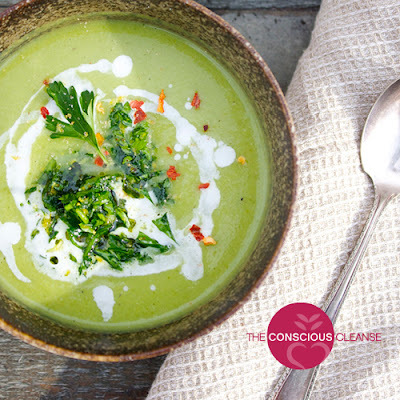 The next Conscious Cleanse starts on June 8, and registration closes on June 6. You can get $25 off the registration fee with code Andrea25. Click here for more information and to register for the Conscious Cleanse. I have written about the Conscious Cleanse numerous times over the past few years. Here are some of my old posts, so you can get an idea of the process and what I have learned. Questions: What do you think you should “clean up” in your life? Among other things, I know it will be good for me to stop drinking so much caffeine. What should you add into your life? I need to make the vast majority of my food vegetables and fruits again. I also need to be more consistent when it comes to exercise. The barre studio I used to go to closed down, and I’ll have to find a replacement. The weather is still all over the place here in the Bay Area - 90s at the beginning of the week and low 60s and rain by the end of the week - actually quite typical for the end of spring around here. I’m not complaining as we are blessed with mild weather year round, and we are definitely thankful for any rain we get. I don’t wear a lot of purple, but this pink, purple and black dress caught my eye when it was on major clearance - I think 80% off - when a Macy’s closed down close to us a year ago. I tried it on just for fun and ended up liking it. I love the fun geometrical pattern and the slight flare at the bottom. And by pairing it with a black cardigan, I toned down the busy pattern a bit. I’ve been trying to streamline my closet and have been mostly replacing neutral foundation pieces in the last six months. My loud Trina Turk pants being the exception! What I have found is that it’s fun to have a few colorful pieces in your closet. I may not get as much wear out of them as out of my well-made neutrals (like my beloved Trina Turk Accomplice top), but color spruces up my wardrobe and I love to wear it on occasion. I wear something colorful once or twice a week; the rest of the time I wear neutrals but may add color with accessories. This may not be apparent from the blog as I’ve been showing a lot of colorful clothes lately. A typical outfit of mine is more in line with my black & white maxi skirt outfit from a few weeks ago. I love color because it can really affect my mood. When I’m in need of some cheer, I wear my yellow cardigan. On a beautiful summer day, I love my raspberry top; it just screams summer to me, and somehow I always feel I “need” to eat some ice cream when I’m wearing it... And on a rainy day, nothing cheers me up like my colorful Desigual coat. Question: Do you wear colorful clothes or neutrals? Or both? What affects your decision what colors to wear on a particular day? I love yellow, but I don’t look very good wearing a lot of yellow, especially close to my face. I got my yellow cardigan about five years ago but haven’t worn it very often over the years. One way I enjoy wearing it is with my blue/white striped Lauren by Ralph Lauren midi dress. By adding a little more blue near my face with the mainly blue neck scarf, I think the yellow works. It may not be the most flattering color on me, but I love the bright yellow, and it always makes me happy! And I think sometimes it’s okay not to wear one of your best colors if an outfit makes you happy. I decided to wear my brown sandals. The sandals have a pretty high (for me) heel, but the platform makes them very comfortable. These days, I rarely wear the same colored shoes and bag as matching shoes and bags is certainly out of fashion. But I really wanted to carry my new, brown Coach bag (bought at the Coach Outlet for 70% off). I have been pretty obsessed with finding the “perfect” brown bag for at least six months, and I even have a Pinterest board devoted to finding one. The more I looked for the “perfect” brown bag, the more I realized that there isn’t a perfect one as there are so many different bags and occasions. While I would love a brown bag with beautiful soft, delicate leather, I know that for my current life that wouldn’t be very practical as I need a bag that’s durable and versatile. Outfit Details: Dress: Lauren by Ralph Lauren (I love this Lauren polka dot midi dress), yellow Banana Republic cardigan (similar), Coach bag (I also love this one). I really like the look of the brown Coach bag, and it’s a nice size - big enough to carry some things (I was able to stuff an amazing amount of items into it during a recent, unplanned emergency shopping trip where I had forgotten to bring bags), but not too big. Plus, it’s easy to care for and can be wiped down if need be. It’s perfect for everyday life right now and, in fact, many years to come. Questions: Is there a color you like but you don’t look your best in? Do you wear it? Do you like yellow? Do you ever wear it? If so, what yellow clothing items do you own? One of my signature looks is leggings and a tunic or short dress. The dress in this outfit is another one of those items I recently “found” in my closet. It lives in my “overflow” closet (= one half of my son’s closet that is very hard to access). I bought it about five years ago at Loft. Unfortunately, it shrunk the first time I washed it, and then I put it in the dryer once by accident. It’s therefore too short to wear on its own. I didn’t wear it for a while until I realized that it is perfect paired with leggings. The weather in Silicon Valley has been all over the place lately - from the 90s to the low 60s, including some rain and wind (which made it seem much colder; and, yes, we are weather wimps here in the South Bay...). I wore the dress/tunic on a rainy day to run some errands. I paired it with leggings, my denim jacket, and a striped scarf. I wore the outfit again on Mother’s Day for lots of walking and a casual brunch outing. Since we walked quite a bit before and after brunch, it made sense to wear comfortable and casual clothes. I usually spend “special days,” like Mother’s Day and birthdays doing something active with my boys, rather than getting dressed up. That doesn’t mean I don’t enjoy getting dressed up once in a while, but birthdays and Mother’s Day are usually reserved for doing some physical activity together. The best part of the day: Family FaceTime with my parents in Germany! Questions: What’s one of your signature looks? Again, one of my signature looks is definitely a tunic and leggings. Stanford’s campus is beautiful, and there is plenty of space to walk around. You can also visit the art gallery, the museum (Cantor Arts Center, which has a nice permanent collection as well as amazing temporary exhibitions on display; plus admission is free! ), and Hoover Tower (there is an exhibit on the bottom level, and you’ll have a wonderful view from the top). Stanford University is a nice place to spend a pleasant afternoon. And on a hot day the stunning, covered walkways provide shade and coolness. Question: What are your favorite spring/summer color combos? My everyday style is casual, classic, and often includes neutrals. However, once in a while, I like to acquire a true standout piece. When I attended the blogger meet-up at Trina Turk in Burlingame in March, I not only bought the Trina Turk Accomplice Top but also some “loud” pants. I had done some research before going and knew I very much liked the wide legged pants that are part of the current swim line. My favorites are the Trina Turk Moroccan Medallion Roll Top pants , the Trina Turk Shangri La pants , and the Trina Turk Montezuma pants . I liked them all but ended up choosing the Trina Turk Montezuma pants because they were long enough (unfortunately, the others were just a bit too short). I’m glad I picked them though as the turquoise in the pants matches one of my bathing suits perfect. And the more I look at the colorful print, the more I like it! I took the pants with me on our trip to the California Central Coast. But, unfortunately, it was just a bit too cold to hang out at the pool. While I originally had only intended to wear the pants around the pool and on vacation, I decided to give them a try in everyday life during a casual weekend outing as I realized that they are really very much like the pajama-style pants that are currently popular. The pants are definitely “loud,” and I feel a bit out of my element, but I like them and they make me feel alive. Questions: Do you own any “loud” pants? If so, when do you wear them? Last weekend we went to the Cider Summit in San Francisco at the Presidio. We love visiting the Presidio because of its beautiful location right on the bay. I was again in a black and white mood and decided to wear my black and white maxi skirt that I got at Loft three or four years ago. I did some pattern mixing by pairing the horizontally-striped skirt with my vertically-striped blouse from Banana Republic (also old). I also wore my black and white necklace from White House Black Market. My denim jacket added much needed warmth and kept everything nice and casual. To add just a bit of color, I decided to wear red sandals and carry my rose gold Rebecca Minkoff MAB bag. We tasted some delicious cider, and the kid and I played nine rounds of Connect Four (I won once...). After the Cider Summit we walked around and explored a bit. We checked out the Gold Rush exhibit. It’s only a one-room exhibit, but it’s very interesting with diaries, medical instruments from the time period, etc. Unfortunately, photography is not allowed inside the exhibit. We also got some coffee in the Walt Disney Museum but didn’t have time to actually go inside the museum as our parking meter was about to expire. We took one last look at the Golden Gate Bridge before we drove back home. Questions: Do you like wearing maxi skirts? Do you like cider? Have you ever visited the Presidio in San Francisco?